There are times when a website will not load correctly, web images do not appear as they should or a site just stops working. A quick fix is to do a clean up in your web browser. As many schools continue to implement 1-to-1 iPad programs under much fanfare, it makes sense for Brewster to reevaluate its 1-to-1 laptop program. As we all know, technology is not important in and of itself, rather it is how we use the technology that is important. In my opinion, Brewster’s 1-to-1 laptop program is stronger then most 1-to-1 iPad programs at this moment in time because of how we integrate the technology into the curriculum. BA teachers have been effectively leveraging the laptop to improve student learning since 1993. To be clear, some schools have proven that the iPad can be a very valuable tool in the hands of students and teachers when intentionally integrated across the curriculum. The question we need to ask and answer is, what value does the use of an iPad offer over a laptop? Can a student and teacher do everything they need to do with an iPad as they can do you with a laptop? Can the iPad stand alone as a primary computing device or is it best to be used as a secondary companion device? A second student pilot was conducted in the spring of 2014, where 6 students were challenged to use the iPad ONLY in class and for the completion of their homework. After the six week pilot was complete, students were brought together in a focus group to discuss their thoughts. Although we aren’t currently conducting any formal iPad pilots, many Brewster community members are using iPads in their professional and personal lives and providing feedback to the Tech office. We watch with interest as Apple and other vendors announce new products with enhanced functionality and we continue to experiment with these tools. Below is a list of the advantages that both the iPad and the Laptop have to offer. Based on research and hands-on experience with using the iPad, it is safe to say that the iPad is not quite mature enough to replace the laptop in Brewster’s curriculum…yet. More to come, stay tuned. Here at the Help Desk we’re occasionally asked “How do I record my screen and include the computer’s audio.” Actually, it’s usually phrased “I need to download this YouTube video”. If you’ve followed our guidelines on how to record your screen using QuickTime from this YouTube video (also on Brewster Academy’s ITD YouTube Channel) you may realize that this method for capturing a video WILL NOT capture the AUDIO “directly” from the computer. Rather, it can only record the microphone input (for copyright protection). 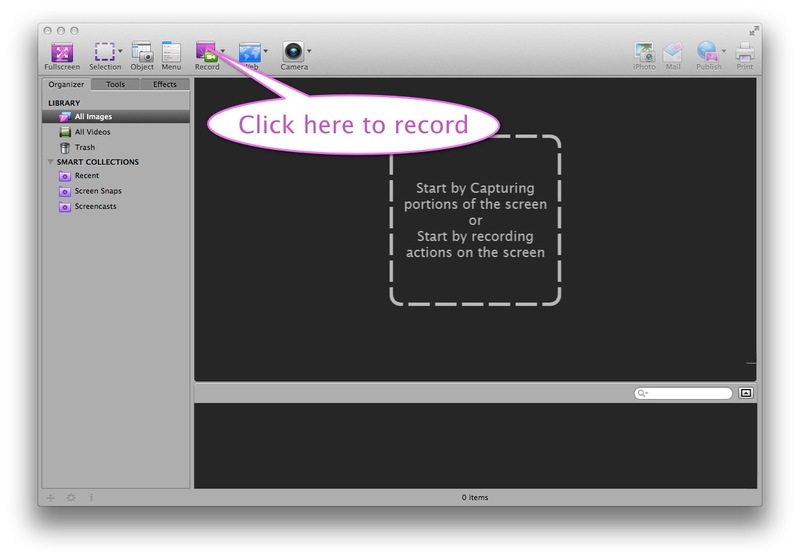 Some users simply turn up the sound and have QuickTime record that input along with the screen to give a full audio/visual recording. It requires a very quiet space in which to record. In circumstances where audio quality is really important to you, you may need to purchase a third party application to record video AND audio together, directly from the computer. These products can become quite expensive ($60-$100), so after review, we have chosen to recommend a product from the Mac App Store called Voila. ($19.99). NOTE: An additional Component must be installed to record computer audio. Faculty and staff can install this on their own after you purchase Voila. Students must come down to the Tech Office so that we may help them install the audio component. To record your screen using Voila. First open the application (after installing as per the above note) and select “Record” from the top of the application window. 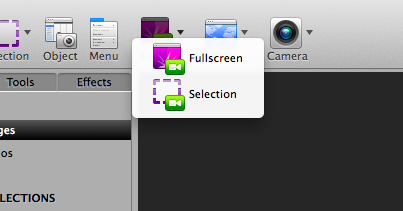 Choose whether you want to record a specific portion of your screen, or the whole darned thing! You will notice that ALL of the Voila windows disappear! This is so it isn’t in your way while you record! 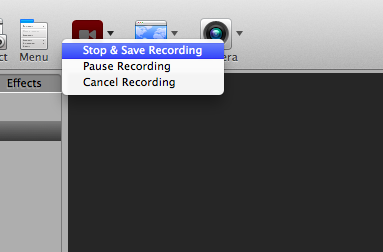 In order to stop or pause the recording click back on the Voila icon in your dock. The main Voila window will appear again, however, the “Record” button you used to start the recording is red! Click on this to either pause or stop and save the video. There are many ways to save the video out to iMovie, Final Cut, etc. Or, if you prefer, you can automatically upload the video to YouTube, Google Drive and more.